LAS VEGAS—For LG, the Internet of Things isn’t just a catchphrase. The company has worked to put the Internet in everything you use, from your washing machine and refrigerator to your watch and TV. Now LG is making it easier for all of those products to communicate with its new lineup of smart appliances that you control with your voice—and an LG smartwatch, of course. At last year’s CES, LG debuted HomeChat, a platform for texting your smart appliances to diagnose problems or change settings. Now HomeChat, which is enabled by the popular Line messaging app, is voice-activated. All you have to do is open the Line app and issue voice commands on your LG smartwatch to your line-up of LG smart appliances, including the smart oven, air conditioner, audio system, washer/dryer, and vacuum cleaner. HomeChat also communicates with Nest so when the thermostat is in away mode, the platform will turn off your appliances or turn on the energy-saving setting. You can also use the app to enable a personalized Coming Home mode, which can include prep like turning on your smart air conditioner to cool your house for your arrival. “We are working to establish HomeChat as a familiar way for customers to access the vast Internet of Things ecosystem,” LG Chief Technology Officer Skott Ahn said during the company’s CES press conference. LG’s appliances were already smart, equipped with Wi-Fi connectivity and Near-Field Communication technology to offer easy remote control access, but with HomeChat, the company is working to make it even simpler (and keep you within the LG ecosystem). After all, who really wants to download a Line sticker pack to send to an oven? No one. It’s much more practical to use HomeChat to search for recipes or tell your washing machine to pause a cycle. Ahn teased a wellness platform LG is working on that will use bio-signal analysis in your phone or wearable device to alter smart appliance settings like the temperature on your air conditioner. LG also has a few low-tech but major updates for its popular washer/dryer duos and refrigerators this year. A new mini washing machine is going on sale as an add-on for the company’s existing front-load washers. 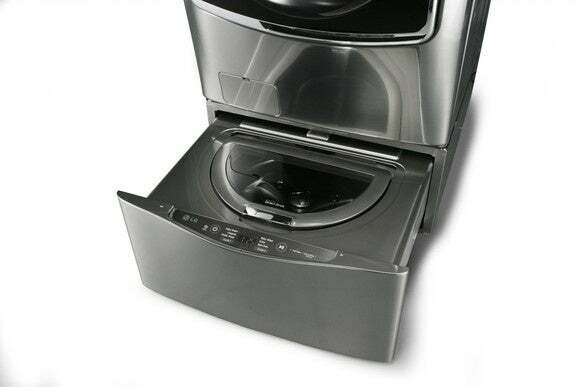 Dubbed the Twin Washer system, the new mini washer fits below the main appliance and is designed for those times when you only need to wash a few items—simply load up the main washer with your full load and the mini with gym shorts or intimates that need to be washed on a special setting. The company’s 2015 refrigerator comes with double door-in-door compartments for tons of extra food storage—and TV chef Rachael Ray swears by it. Smart appliances aren’t the only new products LG has on deck at CES this year: The company also showed off its new G Flex 2 curved smartphone and 4K TVs. This story, "LG's smart appliances now respond to the sound of your voice" was originally published by TechHive.